Summary. On January 8, 2019, the Ukrainian oncology science suffered a heavy loss — the outstanding scientist-pathomorphologist, oncologist, doctor of medical sciences, professor Ludmyla Zakharivna Polishchuk died on the 82nd year of life. We bereaved a great person with a vibrant life and creative path, whose name is associated with the development of Ukrainian oncogenetics. L.Z. Polishchuk was born on November 2, 1937, in the city of Kirovograd in the family of employees. The thirst for knowledge has been inherent to her since childhood. In 1954, she graduated from a school with a gold medal, and in 1960 she received an honors diploma at the Kyiv Medical Institute. 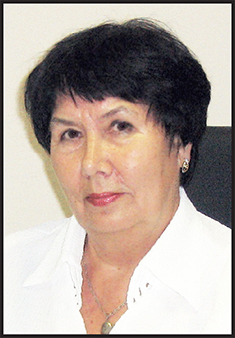 She worked at the Kirovohrad Regional Oncology Center, and in 1966 she successfully completed a clinical residency at the Kyiv Roentgeno­logy and Radiology Institute by the specialty of pathological anatomy and cytology of tumors. Since 1971 her life and scientific activities have been closely linked with R.E. Kavetsky Institute of Experimental Pathology, Oncology and Radiobiology of the NAS of Ukraine, Department of Histochemistry of Tumors (presently — Laboratory of Cancer Gene­tics), which at that time was headed by the leading scientist-oncomorphologist and oncogeneticist, Doctor of Medical Sciences Professor K.P. Ganina. Constant scientific research, enrichment with new knowledge, expanding the range of professional interests — these are the components of Ludmyla Zakharivna’s activity in the field of experimental and clinical oncology. She was an excellent pathologist and experienced cytogeneticist with perfect skills in the technique of morphological diagnosis of tumors. Under the direct guidance of K.P. Ganina, in 1974 L.Z. Polishchuk defended her Ph.D. thesis on the topic: “Cytogenetic study of the relationship between tumor and host in patients with pigmentary skin neoplasms”, in which she demonstrated the complex tumor-host relationships in patients with malignant melanoma manifested at the cellular level, and in 1988 — doctoral dissertation on the theme “Glandular hyperplasia and endometrial cancer (morphological, morphometric and cytogenetic research)”. In 2006, Ludmyla Zakharivna received the title of professor. She first proved that the glandular hyperplasia of the endometrium is characterized by a modified karyotype, which depends on the degree of manifestation of the hyperplastic process and precedes the appearance of phenotypic signs of malignization. For many years L.Z. Polischuk, along with her colleagues and students, investigated and substantiated the need to isolate specific forms of endometrial glandular hyperplasia to develop rational therapeutic measures for the prevention of endometrial cancer. The results of these studies were introduced into the curriculum of the departments of pathological anatomy of the medical universities in Kyiv, Poltava, Kharkiv, Vinnytsia and Odesa and in a number of cancer clinics. L.Z. Polishchuk was the author of more than 300 scientific publications, co-author of 5 monographs, and a laureate of the O.O. Bogomolets Award of the National Academy of Sciences of Ukraine. She actively worked with young people, promoted the formation of their scientific thinking of future oncologists, and trained nearly 10 specialists of higher qualification. In the last decade, she focused on the study of phenotypic features of the ovarian, endometrial, breast, and colorectal cancer, the role of the hereditary predisposition to these neoplasms, and the assessment of the individual risk of cancer in individuals with family cancer history. For many years, L.Z. Polishchuk carried out extensive scientific and organizational work, including that in the Scientific Council of the Institute, the specialized Dissertation Defense Board, was a secretary of the Kyiv Society of Pathologists, an active member of many Ukrainian and foreign scientific societies. Ludmyla Zakharivna Polishchuk was spiritually rich, creative, talented, wise, and cheerful person with an active civic stand, with great responsibility and devotion to work, humanity and love for everything good, bright and beautiful. Colleagues of L.Z. Polishchuk, her students, and friends are deeply grateful to her not only for the rich scientific heritage, but also for the boundless love to poetry, music, theater, which she shared with her environment. The cherished memory of this benevolent, responsive and worthy person will always remain in our hearts.